Drug addiction is a popular topic in the news today, but the portrayal of drug addiction is not as impartial as one would hope. Carl Hart, Ph.D., an associate professor of psychology at Columbia University, is on a mission to correct this bias in both pop-cultural depictions and government policies relating to drug use. First, Dr. Hart notes that drug addiction is not as prevalent as many believe. In fact, according to Dr. Hart, more than seventy-five percent of individuals who initially experiment with drugs, whether legal, illegal, or pharmaceutical, do not become addicted; in those individuals who become addicted, decisions to engage in drug use are often influenced by factors that transcend a physical addiction to drugs. One of these factors includes alternative opportunities in a drug user’s environment. To evaluate drug-seeking behavior, Dr. Hart has performed a number of experiments in his lab at Columbia University. These experiments examine what motivates addicts to abstain from or use a drug. In one experiment, Dr. Hart, with the approval of an ethics committee, offers drug addicts two options: a dose of crack cocaine, or an “alternative reinforcer” such as monetary incentives or vouchers for merchandise. Dr. Hart found that many participants chose the alternative reinforcer over the drug. From this, Dr. Hart concludes that environmental factors influence addicts’ decisions to engage in drug use. Contrary to what is commonly portrayed in the media and by anti-drug campaigns, drug addicts will not do everything and anything possible to gain access to a drug. Instead, drug addicts make decisions based on many factors, one of which is the availability of alternative reinforcers. Dr. Hart’s study on human drug addicts confirms similar findings in animals. In one study, researchers discovered that rats raised in social isolation without environmental stimuli were more likely to press a lever for cocaine than rats raised in an enriched environment with socializing and exercise wheels for play. These studies support the view that drug use does not necessarily follow addiction; drug use is often influenced by factors such as impoverished environments and an absence of opportunities. 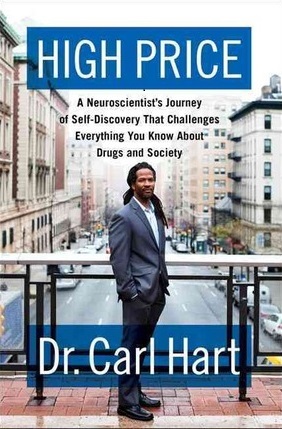 Dr. Hart’s new book, High Price: A Neuroscientist’s Journey of Self-Discovery That Challenges Everything You Know About Drugs and Society, is a fascinating memoir that recounts Dr. Hart’s life, from growing up in a poor community in South Florida to becoming the first tenured African American professor in the sciences at Columbia University. In his memoir, Dr. Hart clearly explains many issues that are prevalent in American society from the perspective of his own experiences and observations. These issues include discrepancies in prison sentences for drugs, such as crack and powder cocaine, as well as the negative impact of incarceration on juveniles. Dr. Hart explains how biased drug enforcement and disparities in prison sentencing unintentionally target racial minorities. In addition, Dr. Hart’s book includes references to scientific studies that are interwoven into his story. These scientific studies shed light on Dr. Hart’s experiences and add a level of analysis that allows the reader to appreciate his perspective. Dr. Hart’s forthright account of his life and beliefs makes High Price a compelling and unusual story that challenges readers to reevaluate their assumptions and search for greater understanding of drug use and addiction. Jul 28 Addressing Forced Duplicity in Black Male Identity and Risky Sexual-Behavior Practices in Tyler Perry's "The Haves and the Have Nots"